Odisha Hydro Power Corporation Limited. Is going to conduct the Graduate Engineer Trainee, Diploma Engineer Trainee and Management Trainee examination in mid-week of December. Hence the applicants who are going to compete for the OHPC written test must download the hall ticket from the official portal, ohpcltd.com. The organization announced that the admit card will be accessible to download from 8th December. Hence the competitors can download the hall tickets and keep them safe to carry to the examination. Candidates have to carry the admit cards without fails to write the examination. The examination officers will initially check the hall ticket of the after that they will allow them to attend the examination. Odisha Hydro Power Corporation Limited (OHPC) is the state government authority of Odisha. This organization invited applications for 96 jobs for Graduate Engineer Trainee, Diploma Engineer Trainee and Management Trainee posts. The application process was held from 10th November to 5th December 2018. Many of the hopefuls seeking to get jobs as MT, GET, and DET in OHPC have applied for the announced posts. The selection of aspirants will be done through the written test and interview rounds. The OHPC is going to conduct the selection rounds shortly. Name of the Recruitment Authority Odisha Hydro Power Corporation Limited. Name of the Vacancy Graduate Engineer Trainee, Diploma Engineer Trainee and Management Trainee. Candidates have to download OHPC Admit cards from the official website, ohpcltd.com. The admit card will be accessible to download from 8th December. The organization is going to conduct the written test round in midweek of December. After downloading the hall ticket, candidates can check the details of the examination venue, date, and timings from it. The admit card/hall ticket will contain the information of candidate’s name, hall ticket number, date of birth, signature, and other details. Candidates can check the details after downloading the admit card. Take a printout of the admit card and carry to the examination. Candidates have to carry any of the valid identity proof along with the admit card. Make sure to carry the Aadhar card/voter id/PAN Card/ driving license or any other identity proof along with the admit cards. Candidates must remember to carry both the documents without fail. The examination will be held in Bhubaneswar. Candidates can check the exact examination center details from the hall ticket. On the homepage, you can find various notifications. 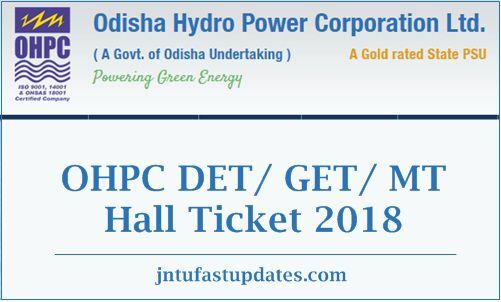 Search for OHPC Hall Ticket/admit card 2018 for DET, MT, & GET download link in the availability dates. It prompts to enter the details such as user id, password etc. Enter the required details and click the submit button over there. The hall ticket/admit card will be downloaded on the screen. Check it and observe the examination venue, date and other details from it. Take a printout of the hall ticket and keep it safe to carry it to the examination. Today is 10th december still not getting any admit card for written exam.